Veteran of the Day graphic created by Alexandra Craig for the U.S. Department of Veterans Affairs. 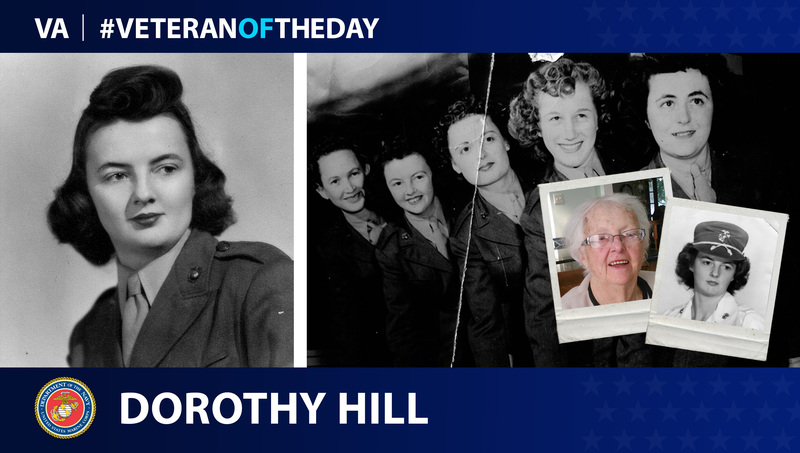 Today’s #VeteranOfTheDay is Marine Corps Veteran Dorothy Louis Hall Hill. Dorothy served during World War II from 1944 to 1946. Dorothy left a good job in 1944 to join the Marine Corps, leaving her family and friends in shock. She completed basic training at Camp Lejeune, North Carolina. She remembers her training being very difficult as it was very hot, and they did a lot of physical activity. She went on to work as a Navy supply clerk after she was interviewed by naval officers who felt she was a good fit for the job. Dorothy enjoyed her time in the Marine Corps. She most liked participating in the parades because afterwards they would often get time off. Where she was stationed the women had their own camp complete with a PX and mess hall. Men were not allowed into the women’s area unless escorted by a woman. Dorothy went to many dances, movies, and spent time in the swimming pool. She remembers being treated respectfully by the men for the most part. Dorothy was able to get off base and go into town often. Dorothy’s enlistment was open ended, meaning she would be discharged only when she was no longer needed. In 1946, she went back to work for the company she worked at before. Dorothy passed away in September 2018. We honor her service. More of her story can be found at http://memory.loc.gov/diglib/vhp/story/loc.natlib.afc2001001.97768/. We honor the service of Marine Corps Veteran Dorothy Louis Hall Hill.